Almost against all odds, the tiny town of Gorokhovets has managed to preserve its architectural heritage of ancient churches and brick manor houses. Despite the incursions of modern society, there are corners of ancient Russia that have preserved to a remarkable degree the beauty of a world long since past. 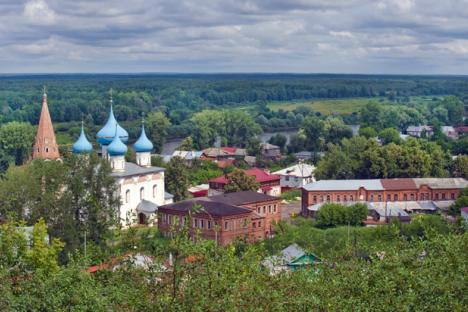 One of the most picturesque of these sites is the town of Gorokhovets (stress on last syllable), situated on the right bank of the Klyazma River some 200 miles northeast of Moscow in the direction of Nizhny Novgorod. Gorokhovets can be compared to another gem from the past, the small town of Borovsk south of Moscow on the road to Kaluga. Both towns were bypassed by the surge in railroad construction over a century ago and thus avoided the rapid growth that would have transformed their historic centers. Both are located near major roads, and yet far enough on the side to exclude highway clutter. And both overlook idyllic rivers bounded by undulating cliffs. In the case of Gorokhovets, the river is the gentle-flowing Klyazma, not far from its confluence with the Oka, which in turn flows into the Volga. In bygone times when waterways were the primary mode of transportation in Russia, this river network played a central role in the prosperity of Gorokhovets. The river basin also provided fertile land. Indeed, the name of the town is derived from the word for pea (gorokh). In 1781, the town was granted a coat of arms whose lower half consisted of five green pea vines supported by stakes on a yellow background. Gorokhovets is thought to have been founded in the mid 12th century, around the same time as Moscow. In those early years the highest point above the river was fortified with a wooden stockade. At that time, both Moscow and Gorokhovets were minor outposts of the Vladimir-Suzdal principality in the Oka River basin, and both were sacked and burned at the beginning of 1239 during the Mongol invasion. While Moscow quickly recovered and began its vast expansion, Gorokhovets languished unnoticed until the late 15th century, when it made a modest recovery and entered the orbit of the Muscovite principality. In 1539, the area around Gorokhovets was subjected to a major raid from the Tatar khanate of Kazan, but the town itself was not burned. Legend has it that the attackers were frightened by an image of a heavenly warrior that suddenly appeared in the light of the setting sun over the main hill, which subsequently became known as Frightful (Puzhalova) Hill. After Ivan IV (the terrible) conquered Kazan in 1552, Muscovy’s eastern territories along the Volga basin were no longer threatened by these periodic raids, but the latter part of Ivan’s reign brought its own disorders. And following the death of Tsar Boris Godunov in 1605, Russia was again plunged into chaos and civil war that ruined the country. Even small Gorokhovets was involved in the struggle with Polish-Lithuanian forces as late as 1618-1619. When peace finally came to a devastated Russia, towns such as Gorokhovets slowly recovered. By the mid-17th century, major trade fairs along the Volga River near Nizhni Novgorod provided stimulus to local crafts — in particular leather working; and the bounty of the land provided produce to sell. During the late 17th and early 18th centuries, the trade of local merchants supported the creation of the graceful whitewashed churches, bell towers and monasteries that still dot the town’s verdant landscape. On the north side of the river is the Monastery of the Icon of the Virgin of the Sign, now being restored to use. On Frightful Hill, high above the right (south) bank of the river is the Trinity-St. Nicholas Monastery, also renovated. From here, the view to the north is one of a seemingly endless expanse of forest stretching to the distant horizon. Down below in the historic center of Gorokhovets are the Cathedral of the Annunciation and the Convent of the Purification, related to the revered icon of the Vladimir Mother of God. At the southwest corner of the convent is the large Shiryaev residence, built at the turn of the 18th century when the Shiryaev holdings included iron factories in Siberia. Remarkably, Gorokhovets still has a number of impressive merchant houses built of brick at a time when even Russians of means lived primarily in solid log structures. Perhaps no other Russian town — not even ancient Pskov — has such an impressive concentration of brick houses in the old fortress-like manner, largely untouched by the Western styles introduced by Peter the Great. Although Gorokhovets also began manufacturing cloth in the late 18th century, it never became a major textile producer. Its provincial torpor continued throughout the 19th century like a spell cast over a fairytale beauty. In 1875, the railroad from Moscow to Nizhny Novgorod passed the town by, but mercantile activity was sufficient to support the construction of schools as well as a number of decorative brick commercial buildings in the town center. Especially appealing are a few wooden houses built with flamboyant carved ornamental details. Like so much of Russia, Gorokhovets was scarred by the cataclysms of the 20th centuries. Its churches were damaged and desecrated; thousands of the region’s inhabitants fought in World War II. In recent years economic stagnation has had a baleful impact, yet through it all, the town’s architectural heritage has survived in a setting of natural beauty beyond the power of words. At a time when so much has been mauled in the name of progress, Gorokhovets is a reminder of how much we still have to care for.